The Pro 2.0 Pedalboard Bag features rugged interior liners with plush top panels to protect knobs and switches, and lightweight plastic reinforced hybrid shells. Your pedals take a beating on stage. In transit, they deserve a break. A soft top panel ensures your pedal finishes are protected, while the rugged vinyl liner resists abrasion. High-density foam bumpers divert vertical impact out and around the case. Integral ABS panels deliver hard case protection at a fraction of the weight. The reinforced outer shell of the case absorbs and deflects impacts. Solid industrial webbing handles come standard on MONO cases. Bar-tack stitching and steel rivets reinforce for strength, while high grade webbing provides a comfortable grip. The removable memory foam shoulder strap lightens the load. Powder-coated steel zipper pulls with self-healing nylon zippers are standard on all compartments. Double zippers double the lifespan of each pocket. All M80 cases feature a hard-wearing sole and piping made of Hypalon—the same industrial rubber used to create inflatable military rafts. This sole simply does not wear out. 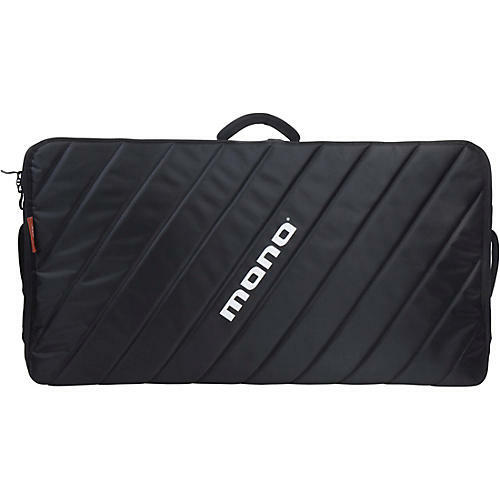 The Pro 2.0 Pedalboard Bag fits one Small or two Lite+ pedalboards by MONO, but will fit other similar pedalboards as well.